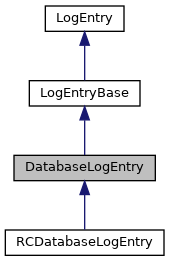 A value class to process existing log entries. In other words, this class caches a log entry from the database and provides an immutable object-oriented representation of it. Definition at line 34 of file DatabaseLogEntry.php. Definition at line 126 of file DatabaseLogEntry.php. Definition at line 185 of file DatabaseLogEntry.php. Get the user provided comment. Definition at line 224 of file DatabaseLogEntry.php. Definition at line 228 of file DatabaseLogEntry.php. Returns the unique database id. Definition at line 135 of file DatabaseLogEntry.php. Definition at line 162 of file DatabaseLogEntry.php. References $blob, $params, LogEntryBase\extractParams(), LogPage\extractParams(), and getRawParameters(). Referenced by getAssociatedRevId(), and isLegacy(). Definition at line 191 of file DatabaseLogEntry.php. References $performer, User\newFromActorId(), User\newFromId(), User\newFromName(), and User\newFromRow(). Returns whatever is stored in the database field. Definition at line 144 of file DatabaseLogEntry.php. Returns array of information that is needed for querying log entries. Definition at line 43 of file DatabaseLogEntry.php. References $tables, CommentStore\getStore(), and ActorMigration\newMigration(). Referenced by ChangeTagsLogList\doQuery(), LogPager\getQueryInfo(), MediaWiki\Auth\AuthManagerTest\testAccountCreationLogging(), and MediaWiki\Auth\AuthManagerTest\testAutoAccountCreation(). Definition at line 158 of file DatabaseLogEntry.php. Definition at line 214 of file DatabaseLogEntry.php. Definition at line 220 of file DatabaseLogEntry.php. Definition at line 154 of file DatabaseLogEntry.php. Definition at line 148 of file DatabaseLogEntry.php. Loads a LogEntry with the given id from database. Definition at line 94 of file DatabaseLogEntry.php. References $row, null, and Wikimedia\Rdbms\IDatabase\selectRow(). Supports rows from both logging and recentchanges table. Definition at line 78 of file DatabaseLogEntry.php. Referenced by ApiQueryLogEvents\extractRowInfo(), RevDelLogItem\getApiData(), DeleteAutoPatrolLogs\getRowsOld(), LogEventsList\logLine(), LogFormatter\newFromRow(), MediaWiki\Auth\AuthManagerTest\testAccountCreationLogging(), and MediaWiki\Auth\AuthManagerTest\testAutoAccountCreation(). Whether the parameters for this log entry are stored in new or old format. Definition at line 124 of file DatabaseLogEntry.php. Definition at line 118 of file DatabaseLogEntry.php. Definition at line 115 of file DatabaseLogEntry.php. Referenced by RCDatabaseLogEntry\getPerformer(), and getPerformer(). A rev id associated to the log entry. Definition at line 121 of file DatabaseLogEntry.php. Definition at line 112 of file DatabaseLogEntry.php. Referenced by __construct(), newFromId(), and newFromRow().